Documents stored in your Office 365 libraries are available on a wide variety of devices, including tablets, phones, and computers where Office is not installed. 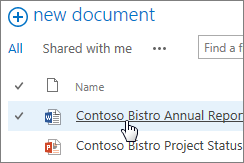 Sign in to Office 365, go to your OneDrive library or team site, and then click (or tap) the name of a Word, Excel, PowerPoint, OneNote, or PDF document. The document opens in your browser, in Office Online. Office Online also opens Word, Excel, PowerPoint, and PDF attachments in Outlook Web App. Just use the Preview command, below the document tile in the message. In Lync Web App, you can view and edit OneNote notes in a meeting (Point to Share, click OneNote, and then click the notebook to open it). On a cell phone, browse to a library or follow a link to a document in Office 365. The document opens (for viewing only) in the phone’s browser. On Windows Phone 7 and later, which includes Office Mobile applications, you can edit as well as view documents. Note: There is no phone-based web app for OneNote. Instead, install the OneNote app for your iPhone or your Android phone. OneNote Mobile is included on Windows Phone 7 and later. For details, see Use Office Online on your Android, iPhone, or Windows Phone. If your phone is some other type (such as BlackBerry or Symbian), see Use Office Online on your cell phone.